Sharing a love of horses. Equestrians share a profound bond with the horses they ride, and when those riders share a bond with each other, it makes those times even sweeter. 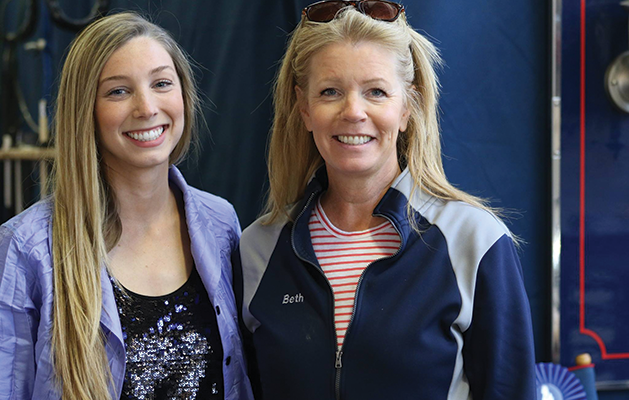 White Bear Lake residents and friends Beth Hemphill and Rebecca Shavlik encouraged their daughters’ love for horses early on and eventually got back in the saddle themselves. These mother-daughter equestrian duos share a love of horses that has only strengthened their relationships over the years. Rebecca and her daughter, Irina, fell in love with Morgans many years ago. When first researching breeds, Rebecca remembered the book Justin Morgan had a Horse. “I would ask horse people, ‘What about Morgans?’ and they would tilt their heads, sigh and say, ‘yeah, if you can get a Morgan, they’re the best!’” The Shavliks now own several Morgans who reside at Hardwood Creek Farm in Hugo. Rebecca says, “I love Morgans because of their classic look, great minds and big hearts. I also love the history of the horse as the first true American breed, and their reputation in the 19th century as great work horses because of their build and heart.” She especially admires “a good ‘typey’ Morgan with all that heart and go.” After years of watching Irina ride, Rebecca got in the driver’s seat—literally. She often “drives” their Morgans, meaning the horses are hitched to a cart. 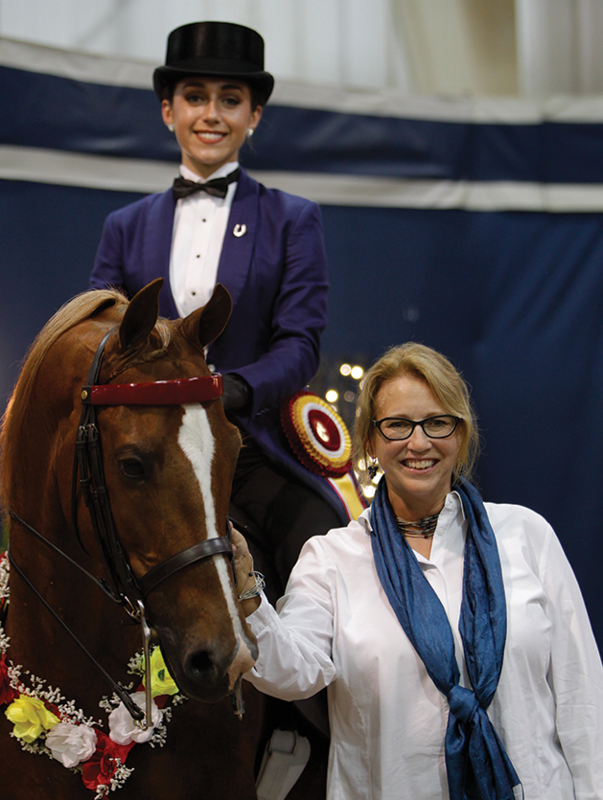 Now a busy professional living in Chicago, Irina still cultivates her passion for riding. She has competed in countless horse shows over the years and continues to ride Western, hunt seat, English pleasure and park styles, “and could never pick one as a favorite,” she says. Like her mother, Irina has an unshakeable affinity for the Morgan breed. “I love Morgans for the history, the breed community and the beauty of the horses. I find it impressive that one breed can be so successful in almost any division they are put into--and it’s tough to find an ugly Morgan!” she says. Beth clearly remembers her first Morgan encounter: “Our family had Quarter Horses and I showed in 4-H. I was at a show and for the first time, I saw Morgan horses. Everything about them was what I had pictured in my mind as the perfect horse. They remind me of what you see on a carousel, and that trot! I was so shy, but I had to touch one. I wanted to ride one, just once. I still feel the same way when I see our beautiful horses. I’m such a lucky girl. It never gets old, ever,” Beth says. She and Sammy have made going to Hardwood Creek Farm together a weekly tradition for the last 15 years. “We look forward to the smell, the beautiful horses, the crazy fun “Creekers” and the best trainers/friends/therapists you could ask for,” Beth explains. Sammy shares her mother’s love for the Morgan. “They are intelligent, level-headed and athletic. They give 110 percent each time you step into the stirrups. There’s also something about the Morgan’s eyes that have always drawn me to them—they have very gentle, trustworthy eyes,” Sammy says. Sammy also appreciates their versatility, having competed in English pleasure, driving and Western divisions. Both mother-daughter duos aren’t hanging up their saddles anytime soon. “I’m not sure what’s in the future, but for now we’re enjoying the ride,” Beth says.